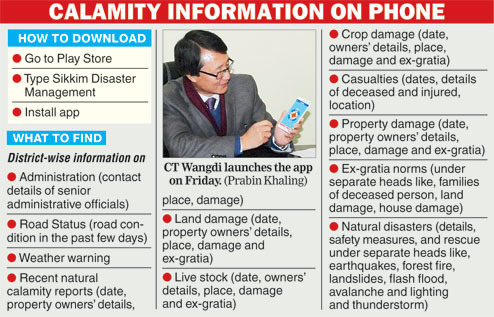 The Sikkim disaster management department today launched a free mobile app that would provide details of natural calamities like landslides and earthquakes, along with road condition and weather warning. The app, developed by a Calcutta-based company, Sysepedia, also has information about recent land and crop damage, casualties and exgratia norms. The Sikkim Disaster Management App was launched by the state relief commissioner, C.T. Wangdi, at the land revenue and disaster management department office. 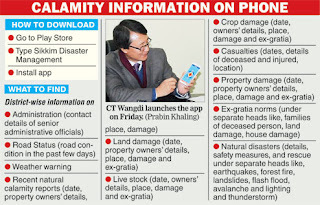 "The application could be useful for smart phone users as a tool to get information on all disaster management activities in Sikkim," said Wangdi. The app can be downloaded through Play Store in smart phones. "One has to type Sikkim Disaster Management and install the app. The information would be updated every day. It is a free app," said a senior official. The district collectors of all four districts of the state would be the "admin" and they would log in and update information. South district collector Raj Yadav said: "We felt it was necessary to launch the application because the present system of disseminating information is time taking. Collectors would gather information from the BDOs and panchayats and report to the head office. Now, the process would be fast and it would be easily accessible."